Kristi Marsh is a mom of three and cancer survivor who dedicates herself to educating women about the interaction between environmental toxins and their health. She empowers other mothers to protect their families by becoming savvy consumers through her organization, Choose Wiser. 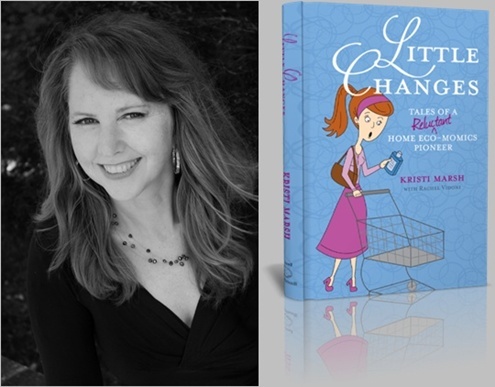 Her book, Little Changes, has been applauded by Women's Voices for the Earth and Campaign for Safer Cosmetics (who also named Kristi as their first "rock star" activist). I'm so excited to feature this inspiring woman on my blog! When and how did your transition to an eco-friendlier lifestyle begin? It all started with a self-discovered lump and a diagnosis of stage 3 breast cancer. Like many, I started fervently reading, researching, and having some “Aha!” moments that ignited in a passion and sense of mission. I was amazed at how many circles of friends were like myself, and lived a life without knowing about the lack of safety in our personal care products or how our food was grown. In the mainstream world, there just isn’t a social comfort level in asking, ‘Hey, can you not spray that hairspray near me? Do you know what it contains?’ This became my focus - to make environmental health an everyday topic among mainstream women. I set out to make this a discussion-able topic. I wake every morning excited to do my part and keep breathing energy into this swelling movement. Going green alone can be challenging enough, but you've got a family. How did you get your husband and kids on board for your green adventure? The seriousness of science, the overwhelming fear of toxins, and the gravity of diseases and disorders—while devastatingly real—can make the message hard for many people to hear. For families especially, I say It is okay to enjoy what you do. It is okay to have fun. Whether we played “select an item at the farm stand with no conditions,” or conquered a new restaurant on a ski trip, it is the sense of exploration that kept the kids involved. Turns out, younger generations are empowered little humans. Born into the green revolution, they reduce, reuse, recycle and celebrate with understanding. Somewhere deep in their DNA, far from marketers’ reach, they too, understand. As for my husband, he was a lot like me. There is a lot of deep branding in being mainstream, and there is a lot of joy in being health focused. It is going through The Change that is hard. The trick was finding areas he had interest in. Certainly worked in my favor that fresh, genuine food – whether it be basil or steak tips – tastes better than grocery store choice! Can you share a tip that will help blossoming environmental and health advocates raise awareness of friends and family without coming off as paranoid extremists? Remember, your actions speak volumes, and yes, people are watching your actions. They aren’t watching and criticizing—they are curious and want to learn. Change is a deeply personal and many just need to digest this new world at their own pace, absorb the messages on their own turf. I created Little Changes to be a tool - a kind, inviting, inspiring way to share the message. It’s not that family and friends are anti-health, they just have to find a way to wriggle out of that old skin and into this exciting world. I believe in them and I believe in you. What's one way you're planning to go greener next? Once I realized that going through the change (from mainstream to health-focused) was not a to-do list but a lifestyle, I started to look at each line item as an adventure. Lately, my children have been asking the ‘right’ questions, bringing new ideas to mind I haven’t thought of so far. For example, my daughter is becoming quite the amazing baker. She wants to create her divine treats with organic ingredients. Last week we found ourselves on a quest to find food coloring that was effective but more natural than what I grew up on. Replacing one product, or habit, and moving forward adds up over time to a lot of pride and satisfaction. Can you share some encouragement for readers just beginning their journey to green living? I will answer that with one of my favorite Little Change’s quotes: ‘There is something incredibly moving to me about linking arms and coming go the side of another. In togetherness, we find safety and strength. Standing together, we become pioneers’. The most impactful little change we can do is to discuss concerns with a friend. Find a buddy. I love efficiency, quick-paced learning, sharing, giggling, and sometimes becoming sarcastic with frustrations and having a gal pal to go through this with makes all the difference. Not to mention the sharing the discovery of little orange clearance stickers or amazing internet finds through a quick text!